Hi all. First post but I've been absorbing some of your wisdom silently. I've been using a pocket watch for some years now but only recently have started anything resembling the collecting of vintage specimens. So...a Swiss-made watch with 'railway regulador' with a 'd'...does this imply use in a non-English speaking country? 'Railway' and 'Swiss made' imply an English market though. My guess would be turn of the century marketing jargon run amok. At the time, association with railroad use would have been a badge of high quality. "Regulador" is not the equivalent of "Regulator" in any of the languages spoken in Switzerland. It is, however, Spanish. I suppose it could be a watch of the caliber approved for railroad use in a Spanish speaking country, but then I'd wonder why "railway" and "Swiss made" are printed in English. 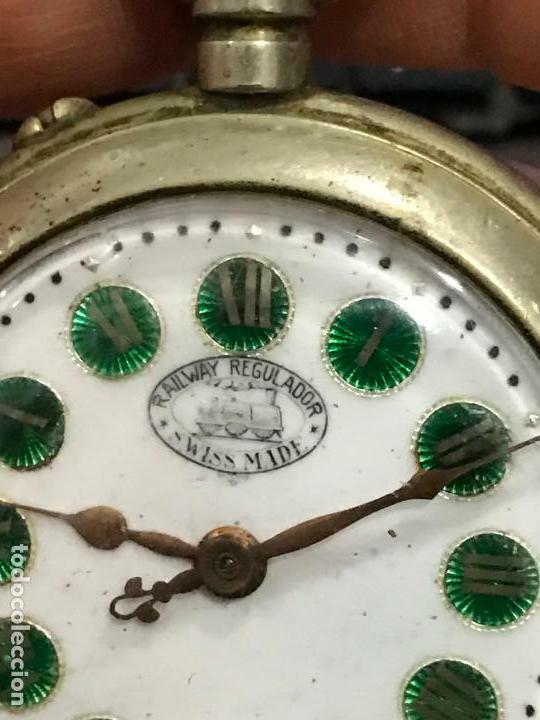 I think the more likely explanation is that this would be a lower quality watch that has a railway reference printed on the dial to suggest that it is of finer quality than it really is. Plus, the green guilloche enamel figures, while a nice looking detail, are not what you typically see in railroad watches. Brought to you by somebody with only a passing knowledge of these matters. Somebody who actually knows will be along shortly. In the meantime, posting photos of the movement will go a long way towards assessing what we're really looking at here. Real men wear small watches. The above picture isn't the one I was looking at. The numbers, such as they are, on the dial are odd. I know they're required to be Arabic for an actual railroad chronometer, so this probably isn't one, unless it just predates that particular requirement. If anyone thinks it's a good price but decides not to bid, let me know. I could be persuaded back. Assuming the page displays the currency in NZ dollars on your end, that's about US$155. The movement shots tell the story. Very low grade cylinder escapement watch. The current bid of $225 seems like a lot. It's definitely a lot. You could get a massively higher quality watch for probably half that amount. It is not even a cylinder escapement. It looks like a Roskopf system pin-lever escapement. I appreciate the help, both in saving me from a bad purchase and in helping me learn what to look for. ↳ What are you wearing today?